Is Broadway the right place for SWEAT? SWEAT, the latest play by Lynn Nottage that started life at Oregon Shakespeare Festival and went on to New York’s Public Theater, is now on Broadway. And that’s great. But is Broadway the right place for this play? Maybe not. 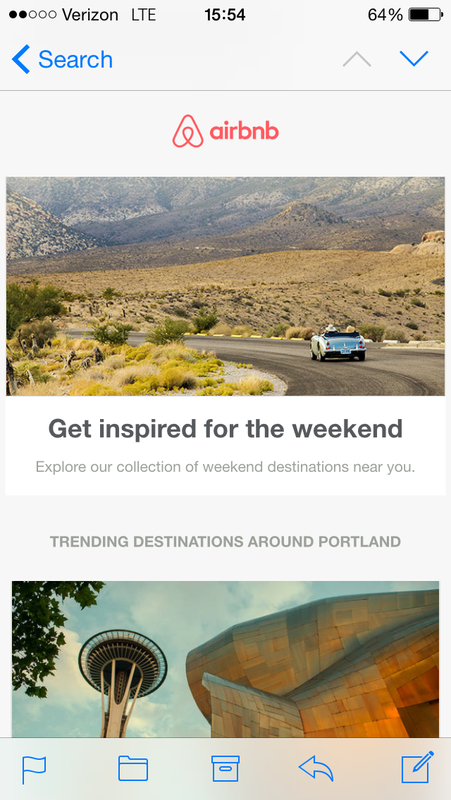 Is your email messaging optimized for mobile? This is a web page squeezed onto a mobile screen. Too much to process for the recipient – and too small. Here’s an issue that most theatres need to take a look at ASAP. And that is whether or not your email messaging is optimized for mobile. As you know, mobile adoption is hockey sticking up to the right steeper than a real time graph of bon mots at the #GOPDebate. Your audience is on mobile. Mobile is the only screen now for many users. Which means they will get your emails on mobile. And attempt to read them there. The entire world needs to come through that little portal. 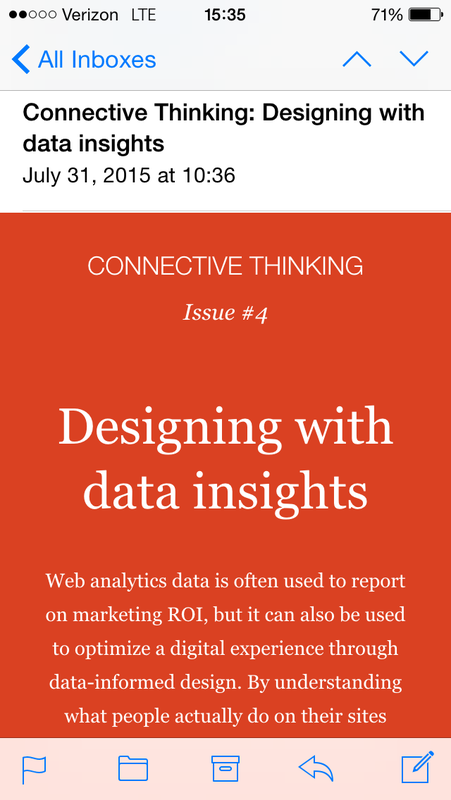 Writing for mobile entails more than just responsive design (which if you don’t have, the user will simply delete your email). It also calls for a style of brevity and focus. When you have less space to work with, what do you with it? More – or less? Less. Emails are not the place for WAR AND PEACE length discourses on your new season or outreach program. Emails are about a succint and compelling CTA (call to action). Emails are a notification, a bell that goes off. You want the recipient to do something when they get your email – usually click on a button that says “Buy Tickets” or “Read the full post”. You want your email to ignite an emotion in the recipient – to give them a feeling or desire. You want your emails to be a work of art – not a long piece of text like something on the wall at the DMV. Many, many emails from theatres are still overloaded with text and frames and boxes – all at a scale designed to be read on a desktop monitor the size of a Broadway billboard. But that’s not what your recipient is using. She’s on mobile. Put yourself in the shoes of the recipient and step through each moment of the interaction when you send them an email. First, a bell goes off or a buzz vibrates. 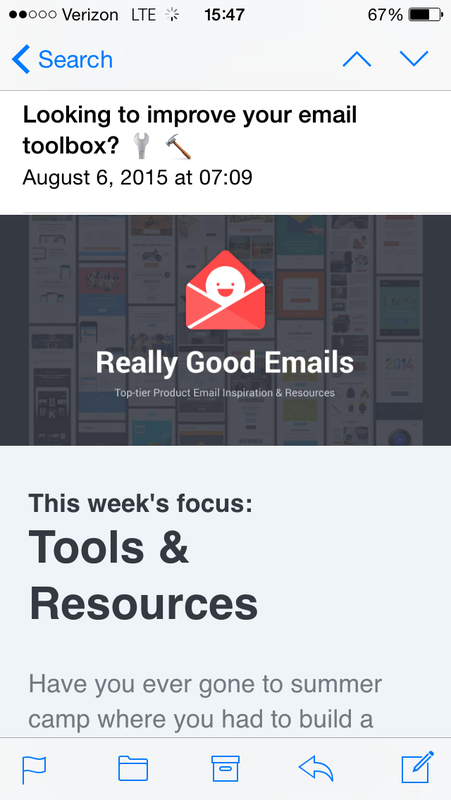 They glance at the screen and see a badge notification (which is where your brilliant subject line does its magic). If you’re lucky they will swipe open. And then they will take a look for a few seconds. What you want to do in that microinteraction is create interest and excitement. Show, don’t tell. Give the user enough info so they’re hooked. But don’t let them off the hook. When they’re done reading they should have an active desire to take the next step. Your email should drive the recipient on – usually to your web site to complete the message, or maybe onto social media where a conversation is going. Email is the single most important channel to your audience, and theatres spend lots of time and money on messaging. Make sure all that investment isn’t wasted. Learn how to write and design for mobile. You’ll stand out from the crowd when you do. We get it. You have a show on. And if the actual event is anything like this digital junk show of over posting, we probably don’t want to go. Hash tags are great, right? They can be a fabulous way to provide an overview of related streams from many different participants. For exammple, check out #SEAthtr or #PDXTheatre for the theatre streams in Seattle and Portland. Judicious use of hash tags allows any one individual to say, “My post belongs to this larger narrative.” And then a reader interested in that larger narrative can go right there and survey all the different parts of the flow. So, yes, using a popular hash tag can be a great way to get some visibility beyond your own followers. But it’s one of those tools you have to know how to use – and not abuse. If instead of a few effective posts now and then you simply fire hose your junk all over the hash tag indiscriminately 24-7, what do you tell the world? You tell them you don’t know what you’re doing as a digital marketer. This is the equivalent of sending the same lame notice to PDX Backstage 20 times a day. We get it – you have a show on. Heard you the first time. The show is always on, and your show before the show tells the audience whether the product on offer is quality – something they want – or merely more noise to be tuned out. Careful with those hash tags. If you overuse them, they’ll bite you on the fanny. In the American – not Irish – sense of that word. Why has theatre become one endless request for donations? If you’re on the list for lots of theatres, you probably get lots of email. And if you read them all, you have become – whether you know it or not – an expert on what good messaging looks like in the theatre world. Simply by reading hundreds of emails from theatres all over the world, you have developed some opinions, likes, and dislikes. You’re actually in a much better position than many of those individual theatres to evaluate what works – because you’re seeing the entire flow. You know who’s nailing it and who’s not. Here’s a recent observation. The best theatres DO NOT ask you for donations. That’s right. Many of the very best theatres there are do not ask you for money. Why? Because they are in the business of creating great product people want – not in taking donations. If your product is selling briskly, stoking demand for it is what your messaging is focused on. You want people to come and buy tickets first and foremost. But if you are a traditional loss-making theatre having trouble moving tickets at any price, you ask for donations a lot. ALL THE TIME. It is hard to emphasize what a weak message the usual “Hi, we’re so happy to have you on this journey with us. Would you like to donate?” bulletin is. Note there is nothing in this message for the audience. And you should never send a message to your audience unless there is something in it for them. When you send a message to your audience with nothing more in it than a request for money, you are telling the world that you don’t know what you are doing in the realm of marketing. And possibly also that your theatre is not doing well. Upon receiving one of these bland requests, the smart audience member thinks: “If they’re not good at marketing, how good could they be at making theatre?” In other words, what is the artistic equivalent of this extremely old school style of marketing? It’s not very attractive. Remember, any audience member on earth knows that if they desire to donate, a theatre will take their money. That’s not news. You don’t have to tell them that. Because theatres so relentlessly tell the world how poorly they do financially (“Ticket sales only cover 30% of our costs!”), everyone knows darn well that donations are wanted. You are not revealing anything new when you ask for a donation. You are simply asking the audience again to do something that they are not doing, because they don’t want to. If the audience won’t buy tickets for $8, what are the chances they’re going to want to donate to support “the work”. See how weak that sales dynamic is? Very low conversion rates. Here’s the psychology. If you create a great product and don’t ask for donations – people WILL give you donations (in the theatre world). If you knock the socks off your audience, you will get people who stumble wide-eyed out of the theatre and come up to the box office person and ask how they can donate. BUT. If you ask people to donate – whether the show is good or crap – it weakens the entire dynamic. And it’s also usually an indicator that what’s on offer in the theatre isn’t all that good. For audience members, the good news is that often an excess of emails asking for donations is telling you upfront that this is not the theatre you want to go to. So that’s helpful. It’s actually quite useful as an indicator species. If great theatres never ask for donations, what does it mean if this one over here constantly does? Probably that it’s not an exciting place you want to be. If you’re a theatre, time to switch the mentality. Assuming you have a great product (and you shouldn’t put on a show until you do), try NEVER asking for donations. Try that. Put on great shows, and create great messages that channel the essence of your live experience. But save the “Won’t you please help us!” pitch. That’s right. Stop asking for donations. Instead, put all your energies into creating brilliant theatre. If you do that, the ticket sales (and donations) will follow. How to tell the world that there’s no demand for a show. Put the entire four week run on sale for practically nothing weeks prior to the first preview. Sales and marketing, the discipline that results in (it is hoped) purchase of actual tickets by audience members (it does happen, ya know), is an art equal in complexity and importance to the better known aspects of putting on a show like directing and acting. Marketing is actually MORE important, because it’s harder to get an audience to turn out than it is to create a compelling piece of drama on stage. The real art form, then, is not theatre itself – it’s cultivating and attracting an audience. The psychology of selling tickets is a big topic, and there’s a lot to it. People like to get a deal, but they also don’t want to miss out on what’s popular. Along that knife edge of desire and fear they tiptoe. If you pay full freight for a ticket only to see a half off sale soon after, you feel like a dolt. But if you hold your bluff too long waiting for a better offer and you’re wrong and the show sells out and everyone else sees it – then you’re really screwed. Meanwhile, theatres want to fill seats, because an empty room looks HORRIBLE. And even as the relationship between ticket sales and theatre budgets grows more tenuous for smaller theatres, and some of them seemingly abandon ticket sales as a major source of funding, moving more towards grants and philanthropic support for their money, producers still want to get some kind of income from tickets. When it comes to communicating with an audience (which is what a group of customers is), email still leads the way. Email is 40 times more effective at acquiring new customers than Facebook or Twitter. It’s better than TV, radio, billboards. It’s better than anything you can imagine. 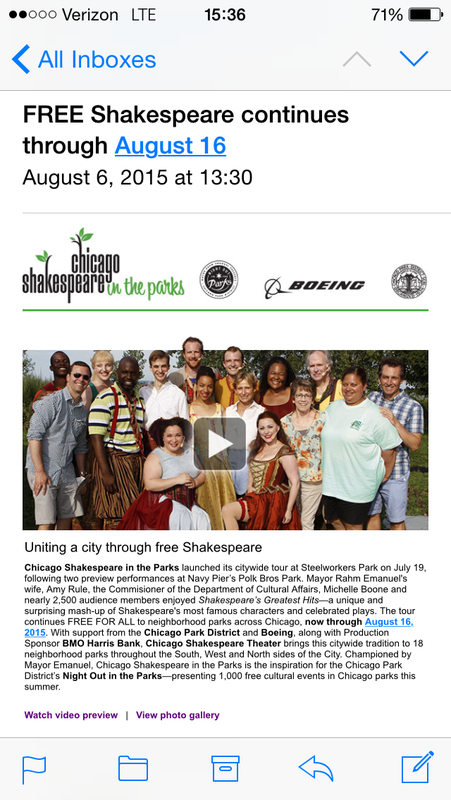 And yet incredibly, many smaller theatres and performance groups still do not have email lists. The email channel is how you whisper in the ear of your audience. It’s how you channel the essence of your brand experience and explain why you’re special. It’s the show before the show. The email show is always on – year round. Whereas a company’s actual shows run for much shorter duration. Given the all important power of email to any brand, the very first thing you should see upon arrival on any web site is an easy way to sign up. If you don’t have an email list and know how to use it, don’t be surprised if no one comes to the show. If you have no email channel, get ready for the sound of one hand clapping. How important is SEO to your theatre or arts web site? It’s just about the most important thing there is. It’s no longer enough to simply publish some stuff somewhere on the internet and hope everyone finds it. That’s kind of like leaving an old TV next to the curb and waiting for it to disappear. You have to optimize your content so that the hordes of potential customers and audience members who are looking for what you have can find it. The second someone types in whatever comes to mind as a description of what they want in Goggles, you want your results to be on top. And you do that through SEO. 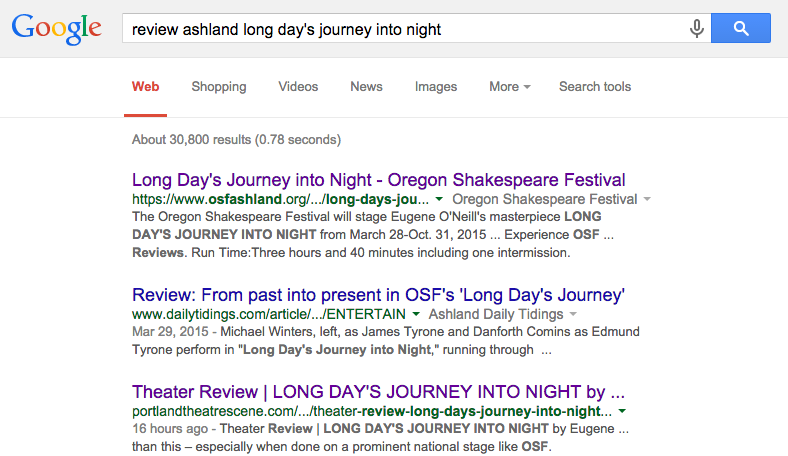 When I search, I see the review I published yesterday already in number three position – second only to the OSF web site and the Ashland Daily Tidings review. According to Goggles, we’re number three for an OSF review. That’s nuts for a little piss ant theatre blog. How could that be? Many, many much larger media have reviewed this show at OSF. So why don’t they come up higher in the results? SEO. If my blog can come back at number three, that shows you how important SEO is. So if you’re a little upstart business or arts group, it doesn’t take money to make it easy for the world to find you on Goggles. How do you do this? In a nutshell, your content has to match what people are searching for. So here’s a real easy example. If you have written a theater review of a show, make it real easy for the world to find it by putting all those words in the title. …then your content just disappeared in the results. Because no one is searching for those words. You have to give Goggles some way of knowing what your stuff is. Nutshell: If you want to go beyond simply publishing something on the electronica net and get to the really exciting part where someone else actually reads it? You have to learn your SEO. Until you do, you’re writing a private diary in a very small room.